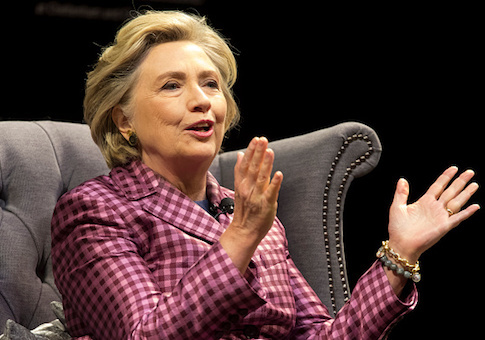 Two-time failed presidential candidate Hillary Clinton posted on Facebook Saturday to try and explain her widely-criticized comments made in India about Donald Trump voters and his presidential campaign. Clinton wrote that during the interview, she was asked whether Trump is a virus or a symptom of something deeper going on in American society. "My first instinct was to defend Americans and explain how Donald Trump could have been elected," Clinton said. During her comments in India, which were criticized by both the right and left, Clinton said in 2016 she was successful in parts of the country that are "optimistic, diverse, dynamic, moving-forward" while Trump won more "backward" regions. "His whole campaign, ‘Make America Great Again,’ was looking backward," she said. "You know, ‘you didn’t like black people getting rights, you don’t like women getting jobs, you don’t want to see that Indian-American succeeding more than you are, whatever your problem is, I’m going to solve it.'" Clinton claimed in her Facebook post that her remark about Democratic regions contributing more to the economy was to explain why there was less optimism in areas that voted Republican. "That doesn’t mean the coasts versus the heartland, it doesn’t even mean entire states. In fact, it more often captures the divisions between more dynamic urban areas and less prosperous small towns within states," Clinton said. The former presidential candidate said she was taken aback by how strong the reaction was to her comments about white women listening to their husbands and voting Trump. "As much as I hate the possibility, and hate saying it, it’s not that crazy when you think about our ongoing struggle to reach gender balance – even within the same household," she said. But while she was surprised at the reaction to her comments there, she now says she–at least partially–understands. "I understand how some of what I said upset people and can be misinterpreted. I meant no disrespect to any individual or group," she said. However, she did not go so far as to say she was sorry for her comments, instead saying "out future requires us to learn from 2016." "So to those upset or offended by what I said last week, I hope this explanation helps to explain the point I was trying to make," Clinton added. This entry was posted in Culture and tagged 2016 Election, Donald Trump, Hillary Clinton, India. Bookmark the permalink.